Keep it colourful! If you want your logo to pop, this is the card to pop it on. 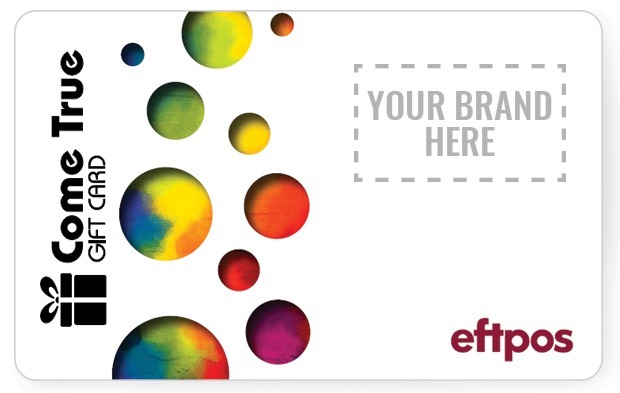 Bright colours make for a stand-out eftpos gift card that will make the most of its place in your recipients’ wallets. We think this one is perfect to celebrate a stand-out staff member or customer, but you can do whatever you like with it! We know that this is one of the bolder choices in our co-branded range and might not work for every recipient, so we’d like to remind you that your order can include multiple designs. You don’t just have to pick one design for the whole batch. When you’re filling in the enquiry form, just note which other designs you’re interested in and we’ll be sure to get back to you with everything you need.